If there is one meal that we thought couldn’t be reinvented, it’s pizza. Even if pizzerias seem to have thousands and thousands of toppings it is always the same round and greasy thing in the end. If, like me, you are tired of the boring traditional pizza and all the calories that come with it, I have the perfect solution for you. Kono Pizza, located on Ste-Catherine St. near Concordia’s downtown campus, offers the changes you need. Created in 2002 by the renowned Italian culinary master Rossano Boscolo, Kono Pizza is a unique project of its kind.The ‘Pizza da Passeggio’ (walk-away pizza) in the form of a cone, is the result of advanced studies and research both of a culinary nature and in terms of technological innovation. As soon as you walk through the door you can feel the influence of Kono’s Italian heritage. The white walls and pale floor contrast with the bright red accessories, creating a young, modern setting which gives you the impression of sitting in a lounge, not a pizzeria. There are a few tables spread around the narrow shop if you decide to stay. You can even sit in the small mezzanine, which gives you a good view of the entire restaurant. But if you feel more relaxed and don’t want to sit at the regular tables, there are plenty of comfortable, stylish sofas for you to choose from. If this is your first time, don’t worry, the staff will eagerly explain the menu to you in detail and even offer some recommendations. The menu is really simple, offering four types of pizza cones. First, there are breakfast cones (typical egg, bacon, cheese) if you go in the morning. Then the regular pizza cones are pizza classics (such as margherita, pepperoni, pesto), deli cones, which have a certain Italian flair to them (including ingredients such as prosciutto, italian cold cuts, and olives. ), and sweet cones, if you have space left for dessert that is. For the dessert cones you can can choose from ingredients such as fresh fruit fillings, yogurt or custard, or rich Nutella. The menu is simple and easy to understand, maybe a little too simple, as it might seem that the choices are really limited. Five types of pizzas and only four choices of meats, but Kono Pizza vary the options intelligently by changing the combinations per pizza. If you are a meat lover, then I recommend the Carni pizza (made with tomato sauce, cheese, sausage and bacon), as it is filled from the bottom up with delicious melted cheese and mouth-watering meats. If you are vegetarian, there’s the Vegetarino pizza (made with tomato sauce, cheese and different kinds of vegetables). Each pizza is approximately $6, which is a bit expensive for the size of the cone. However, if you take the trio at $10 (including a cone, a dessert or a salad and something to drink), then it really is worth it. I certainly couldn’t have eaten anymore when I was done. For the people watching what they are eating, it is good to know that nothing is fried and that everything is cooked in the oven from fresh, not frozen. The total amount of calories per pizza cone is only 250! Even if you are not counting those calories, you will still enjoy Kono Pizza for its excellent taste and fresh ingredients which really make an incredible meal. Though I was very impressed by Kono Pizza, their location isn’t the best as they are right next to La Belle Province and a McDonald’s. This could explain why the restaurant is mostly empty at rush hours. Overall, if you are in a hurry or just want to hang out with friends, I highly recommend that you check it out. The atmosphere, tasty food and interesting concept will make you forget about the hamburgers and poutine next door. 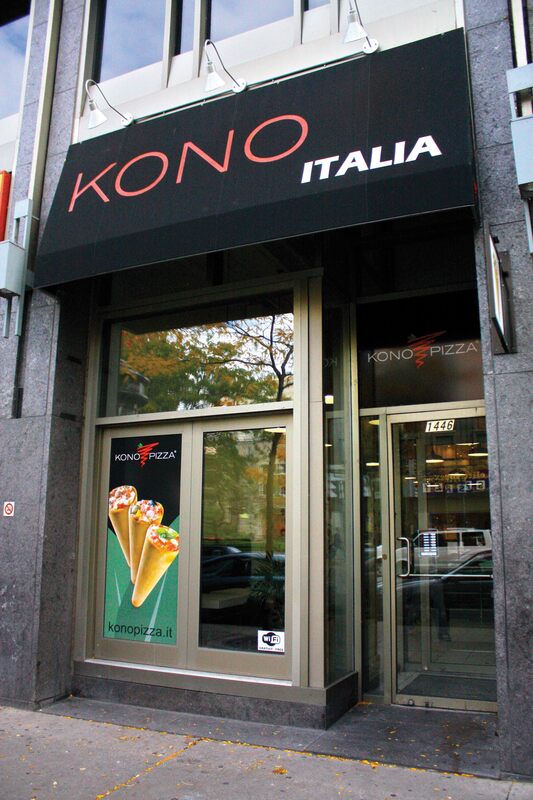 Kono Pizza is located at 1446 Ste-Catherine St. W. Open every day.